You might think that promotional products have little affect on your customers, however, several studies have proven otherwise, and they’ve shown that American consumers actually love receiving promotional products, also known as swag. According to these studies, custom products act as long-lasting advertising, and they certainly stand the test of time. If consumers find promotional products to be useful, they are more inclined to keep them. Thus, by receiving a promotional product, not only does your brand recall rate increase, but so does the likelihood of that customer making a purchase. We’ve seen how promotional products have benefited businesses of all sizes, but if you’re still not convinced about the impact of promotional swag, here are just a few reasons to consider it as part of your marketing campaigns. Unlike television, print, and other forms of mainstream advertising, there is more focus on the individual customer. For a customer to remember your brand, it has to be personal. A customer can flush out all the extraneous and intrusive messaging, and actually get up close with the brand. Also, when it comes to the other forms of advertising, a customer cannot hold on to that brand message for very long. On the other hand, promotional swag really does stick. PPAI research has found that 89% of consumers surveyed could remember the advertiser on a promotional products received in the past two years. It also found that three times more than any other form of media, customers who owned promotional products were more likely to actually contact the advertiser on the promotional product. With an understanding of your business’ target audience, you can offer them custom branded promotional swag that is unique, yet still relevant to their lifestyles. Just to name a few; custom branded bluetooth speakers, tumblers, and stress balls. This personalization is not something that can be achieved through traditional advertising. When you initially develop a marketing campaign, your business probably already has a specific target audience in mind. But in establishing that, remember that target audience will not be set in stone. You may soon discover that your customer is outside those boundaries. The mobility of promotional swag allows your branding message to be seen by even more consumers far beyond the reach you expected. Greater brand exposure means more impressions and more business generated. Promotional products like t-shirts, drawstring bags, and mobile phone accessories are terrific options for making this a reality. Nowadays, connecting with customers has become harder than ever before. Your business is constantly competing for the attention of customers. When you show consumers that they matter to you, they will be more willing to reciprocate that kind gesture. This means actually doing business with you. The study done by PPAI bolsters this notion. After receiving a promotional product, consumers made a purchase 20.9% more often than after viewing a print ad, TV commercial or online ad. Time and time again, research has proven that custom branded promotional swag really does have business and brand boosting power. 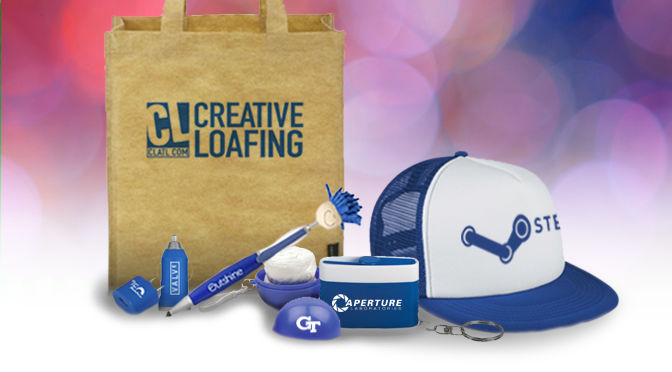 Custom branded promotional swag should not be regarded as just as throw away tchotchkes. Customers really do love receiving them, they make your brand more personal, expand your brand reach, and most importantly do drive sales. So don’t wait and wonder any longer, and get promoting!